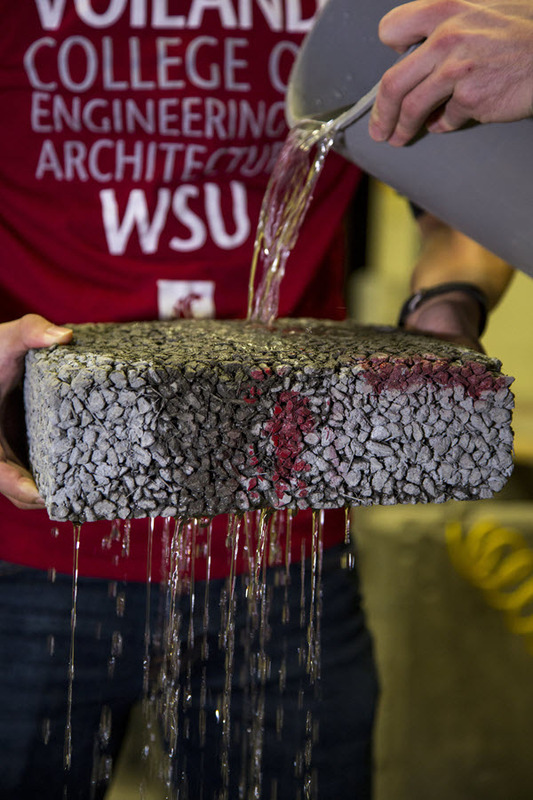 Researchers in the Department of Civil and Environmental Engineering at Washington State University have demonstrated that permeable pavement can be improved with the addition of recycled carbon fiber composite material. Associate research professor Karl Englund and Assistant professor Somayeh Nassiri supplemented permeable concrete mixes with composite scraps sourced from Boeing (Chicago) manufacturing facilities and found that cured specimens exhibited increases in both strength and ductility. Three permeable pavement mixtures containing 3%, 4%, and 5% cured carbon fiber composite material (CCFCM) by volume were tested against a control mixture with no added material. Following 28 days of testing, all three CCFCM mixtures showed infiltration rates above the acceptable level of 1200 cm/h and significantly outperformed the control mixture in terms of split tensile strength and flexural strength. Additionally, load-displacement curves of CCFCM mixtures showed increases in toughness indices. The resulting material they used still contained resin and functioned more like a composite than a fiber, retaining much of its inherent strength, according to Englund. “With that in mind, it can be used as a reinforcing element to a variety of different matrices, and porous pavement is one,” he said. One of the first concerns was whether the recycled carbon fiber would potentially effect water quality. Addressing this, the researchers worked with the Washington State Stormwater Center in monitoring contaminant levels of water before and after filtering through a cast mixture. During the investigation, Englund and Nassiri experimented with different size fractions to determine what represented the best reinforcing component. Mechanical milling tended to produce long-aspect ratio — or needle-like — shapes, and the researchers set out to identify the most optimal. Following lab-scale tests, the researchers are currently conducting a demonstration project and are also evaluating the logistics of establishing a supply chain.